Well the sunshine is here after such a storm ! Wysipig at Ellis's Hill Farm, Sindlesham Road. Arborfield and is looking forward to it’s monthly open day this today This month customers can learn about what Arborfield’s oldest farm shop has to offer for those planning a party this summer, from barbecues to hog roasts. Visitors can enjoy breakfast baps in the morning, hog roast rolls for lunch and tea and cakes in the afternoon. They can also see the vintage tractor collection along with the animals. The gift shop in the barn will be open for visitors, it has a good range of gifts, bric-a-brac and second-hand items. For more information, follow us on Facebook or Twitter or call (07774) 989362 . Visitors are welcomed to this family farm in Berkshire. Photographic Displays with talks at regular timings, on the history of a farming family over the past 150 years, the Womens Land Army and it's role in both world wars. Learn about the concept of local food and it's journey from farm to consumer. 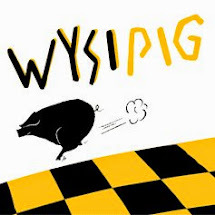 How small artisan producers like 'Wysipig' have carved a niche market with a loyal customer base, providing high qualty pork and beef products, at 'Farmers Markets' from the farm shop and delivered to the door. Visitors will be able to see the large collection of vintage tractors and machinery. The farm shop and tea garden will be open, visitors will be able to enjoy the 'Wysipig Giant Breakfast Bap' , Hog Roast Rolls or Afternoon Tea and Cakes. There will also be a full range of pork and beef products prepared by the farms resident 'master butcher, Kevin Turner. Visitors wishing to make a weekend of it can camp on the farm - for details please see our webesite www.camping-berkshire or telephone us. There are three woodland walks on offer of varying duration from 20mins to one hour, maps will be available on the day. It is not nescessary to book, but plese be patient if we are busy when you arrive. Looking for Something to do today ! Well its June at last, why not come up for breakfast bap or tea and cakes ,we are open from 10am to 4pm, the farm shop has loads of goodies on offer, the tea garden is all spruced up and the shop in the barn is full of gifts and bits and pieces. Oh yes and what a treat, the sun is shining !